Any music fan who listened to Eric Leblanc’s CFUV radio show knows that he was one of the best radio disc jockeys in the world. For over three decades, Eric’s weekly Let the Good Times Roll show on University of Victoria’s CFUV was blues heaven for music fans both locally and around the world. Eric’s love of blues began during his childhood in Montreal. He and his brother would travel to New York City to buy obscure recordings to play at their Montreal dance club and later on Eric’s first show on McGill University’s radio station. Eric was a self-taught blues scholar and co-authored Blues: A Regional Experience with Australia-based Bob Eagle in 2013. He also taught courses in the history of jazz and blues at the Victoria Conservatory of Music. Music was his passion, but Eric was equally accomplished in his professional career. After completing his M.A. in mathematics at McGill University and a McGill Graduate School of Library Science degree in 1974, Eric worked at the National Research Council’s Canadian Institute of Science and Technology (CISTI) in Ottawa from 1974-1979. He moved to Victoria to become librarian at the Dominion Astrophysical Observatory from 1980-2005. In addition to his long-running show Let the Good Times Roll, for a decade Eric also co-hosted Rollin’ & Tumblin’, an acoustic blues program on CFUV featuring his large, personal collection of seminal country blues recordings. Eric’s impressive collection of blues, gospel, rhythm and blues, doo-wop, harmony groups, jump blues, and jazz records was donated to CFUV at his death in 2015. His library of over 300 music-related books was donated to the University of Victoria Library. Friends and fans who dearly miss Eric’s intimate, raspy, Quebecois-accented radio voice, his deep knowledge of the blues, and his warm, funny, and generous personality have started a project to celebrate his legacy. They are fundraising with a series of ‘Blues for Eric’ benefit concerts in Oak Bay to create the Eric Leblanc Memorial Scholarship for music students in the University of Victoria jazz program. 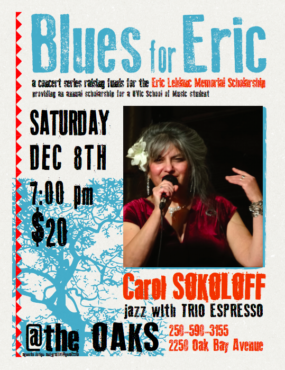 The next ‘Blues for Eric’ benefit concert features Billie-Holiday-inspired and Peabody Award-winning jazz vocalist Carol Sokoloff, as well as the jazz group Trio Espresso — which will feature UVic student Isley Owens on bass. The event will take place at The Oaks Restaurant and Tea Room in Oak Bay on Saturday, Dec. 8 at 7 p.m.
Upcoming shows will feature Maple Leaf Award-nominated blues star Deb Rhymer on Saturday, Jan. 26, and Vancouver Island Music Festival Director and slide guitarist Doug Cox partnering with guitarist Ken Hall on Saturday, Feb.23. 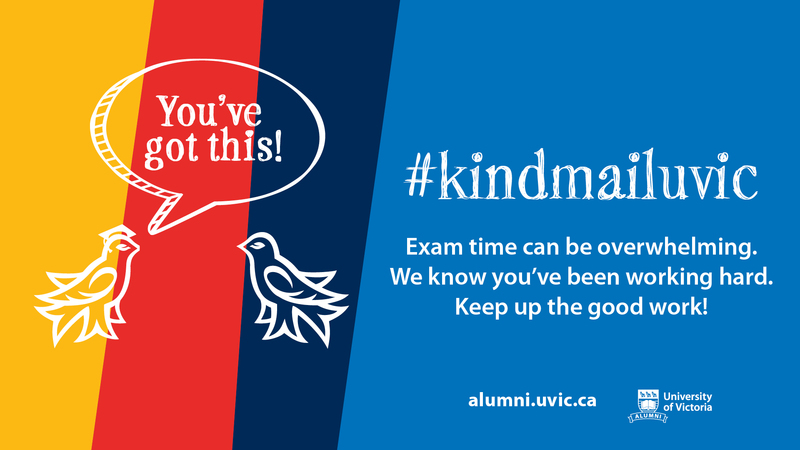 Both performances will take place at The Oaks at 7 p.m.
To donate to the Eric Leblanc Memorial Scholarship please visit https://extrweb.uvic.ca/donation-forms/faculty-of-fine-arts.